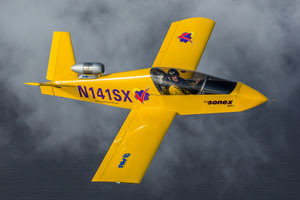 Sonex Aircraft, LLC is pleased to announce that JSX-1, the #1 proof-of-concept prototype of the SubSonex very, very light jet will be flying during the Showcase presentation at EAA AirVenture Oshkosh 2012! The SubSonex is currently scheduled to fly a 5-minute demonstration in three of the week’s pre-air show showcases: Monday, Wednesday and Saturday. The AirVenture showcase takes place between approximately 2:30 and 3:30 pm each day, just prior to the air show. JSX-1 will be piloted by famed air show performer Bob Carlton. Carlton has flown much of the JSX-1’s flight test program for Sonex Aircraft, LLC and is known for his Super Salto jet powered glider act, also appearing at AirVenture 2012. The SubSonex is a jet aircraft kit concept designed to cross “jet jock” off your bucket list in an easy to build, easy to fly premium kit package. The JSX-1 proof-of-concept prototype is being used to explore the viability of the design for a possible aircraft kit product in the Sonex Aircraft lineup. Using the PBS TJ-100 engine package, the aircraft has been extremely successful to-date, and JSX-2 is already under construction with enhanced features. See the JSX-1 up-close in the Sonex Aircraft booth display at AirVenture: North Aircraft Display area, Booth 622.